Although academician A.A. Dorodnitsin himself was not inventor or designer of computers, he made important contribution to their implementation, as well as to application of computation methods and computer assisted technologies of experiment, in various fields of science. Besides that, he many years headed special State Expert Commission on new hardware models control, which made evaluation of all new computers and carried out final decision on beginning of their serial production. Anatoly Alekseevich Dorodnitsyn was born in settlement Bashino near town of Kashira, some 120 km South from Moscow, on the 2 nd of December 1910. His father was a local doctor. In 1931 he graduated from the faculty of mine engineering at the Institute of Oil Production in town Grozny (now Chechen Republic). The following four years he spent as chief of seismological and geological exploration teams in the Urals, Bashkiria and Turkmenia. His first scientific researches A.A. Dorodnitsin made in 1935 with beginning of work at the Head Geophysical Observatory in Leningrad (St. Petersburg). His first task consisted in experimenting in the field of dynamic meteorology. At the Observatory he studied atmospheric front separating masses of air which had different physical parameters. He performed systematic and detailed registration of the air compression, what made possible subsequent analysis and generalisation of the similar results previously obtained for uncompressible liquids (by N.E. Kochin). However, N.E. Kochin studied behaviour of the air flowing around the Earth relief with an accepted simplification, namely that the air was also uncompressible. Dorodnitsin dismissed that and returned to real conditions, what permitted him to obtain very interesting results which he published in 1938 and 1940. Working on the theory of general circulation of the atmosphere he studied distribution of the pressure on the earth's surface within stationary zonal circulation of the atmosphere. In his article “Mathematical theory of general circulation”, written in 1939 (together with B.I. Izvekov and M.E. Shvets) , A.A. Dorodnitsin emphasised essential influence of the atmospheric turbulent viscosity and noticed possibility of the additional warmth inflow through turbulent heat-conduction and (warmth) radiation. At that time he was a post-graduate of the Head Geodesic Observatory working on dissertation research, under supervision of I.A. Kibel. Also in 1939 he successfully submitted thesis, which was named, “Some problems of air flow-around of the earth relief”, and was awarded degree “Candidate of Physical and Mathematical Sciences”. His theory of atmospheric currents on the Earth relief had essential practical importance for studying of various meteorological processes and phenomena. For example it was successfully implemented for studying the phenomenon of Novorossiysk ( Black Sea port) strong local coastal winds blowing from the earth towards the sea (so-called “Bora”). A.A. Dorodnitsin also studied temperature disturbances of gradient winds, motion of the air masses crossing coastal line and also breeze and monsoon circulation displaying its non-linear and non-stationary nature. He proposed condition of the warmth, not temperature, balance on the Earth surface, and now it is commonly adopted for weather forecasts and in solving problems of the atmospheric and marine mediums interactions. In the beginning of the 1940-s, rapid development of aviation increased the need to study flows of compressible gases, what led to subsequent creation of aerodynamic calculating methods of aeroplane design for high-speed flights. Those problems were studied by the Central Institute of Aero- and Hydrodynamics (CIAH) which concentrated the leading scientists of that field. In 1941 A .A. Dorodnitsin was invited there to conduct theoretical researches on boundary layer in compressible gases. He published obtained results in 1942 in the periodical “Reports of the AS USSR” and in the journal “Applied Mathematics and Mechanics”. In 1942 he proved and recommended conversion of the independent variables in those problems which is now considered to be classical one and named after A.A. Dorodnitsin. By the same 1942 he completed and successfully submitted dissertation thesis, “Boundary layer in compressed gas”, and was awarded doctorate (“Doctor of technical sciences”). Subsequently he conducted number of researches on vertical theory of wing and on supersonic air-flow around the bodies of rotation. Researches performed by Dorodnitsin and later by his pupils and followers resulted in completed theory of aerodynamic resistance at high and super high flight speeds. They also provided possibilities to create efficient calculating methods applicable for both laminar and turbulent conditions. Those methods were also widely used in applied design projects of supersonic airplanes and in calculations of the space ships flight dynamics, during their entering the earth atmosphere. A.A. Dorodnitsin remains in history of the Soviet science as one of the creators of theoretical fundamentals for jet propelled aviation – aerodynamics of high speeds. His scientific contribution in the field of aerodynamics and his design of wings for supersonic aircrafts were three times prized with the “USSR State Premium” (in 1946, 1947 and 1951). A.A. Dorodnitsin always felt deep gratitude to his first teacher and scientific supervisor academician N.E. Kochin (1901-1944) – prominent expert in applied physics and mathematics. In 1932-1939 he worked at the V.A. Steklov Mathematical Institute of the AS USSR and in 1939-1944 at the Institute of Mechanics AS USSR . Kochin not only helped his able student in work but made decisive influence on forming and quick progress of his scientific interests. When A.A. Dorodnitsin headed the AS USSR computer centre (very important position) he always had portrait of N.E. Kochin over his desk. He also had one more portrait – of S.P. Korolev (creator of the first Soviet space ships) – his other teacher. From 1045 till 1955 A .A. Dorodnitsin was working at the V.A. Steklov Mathematical Institute at department of applied mathematics under guidance of academician M.V. Keldysh (future president of the AS USSR). There he obtained notable results on theory of asymptotic methods of ordinary differential equations solution. His special complex of asymptotic solutions of self-oscillating type for Van-der-Pol non-linear equations was published in 1947. A solid research “Asymptotic laws of distribution of proper values for some specific kinds of differential equations of the second order” (in particular for systems of Sturm-Liouville differential equations) was published in very authoritative and competent academic periodicals “Achievements of Mathematical Sciences” in 1952. As early as in 1951 A .A. Dorodnitsin proposed new method of integral co-relations for numerical integrating of non-linear equations in partial derivatives. In 1956 he made an observing report on that method and experience of its applications to solving problems of gas dynamics. That was done at the Third All-Union Mathematical Congress. In 1953 AA Dorodnitsin was elected a full member of the USSR Academy of Sciences, for department of physical and mathematical sciences (speciality – geophysics). In 1960 he produced generalised schema of the integral co-relations method, which proved to be highly efficient. Its further development was performed by a scientific team supervised by Dorodnitsin himself, at the Computer Centre of the AS USSR. He had already become a big scientific authority by that time. school of programming and software development (Prof. V.M. Kurochkin). In 1983 Dorodnitsin was awarded “Lenin Premium” (the USSR most honourable premium). In the beginning period of electronic computing Computer Centre of the AS USSR became the leading scientific organisation in that field. It means that, besides its scientific functions, it automatically had to be a sort of testing laboratory for new computers. The first pieces of almost each computer modification were mounted at that priority centre, where they were operating (and thus examined) in a “heavy-duty” mode. Most of them were thoroughfully inspected by so-called State Examination (expert) Commission and A.A. Dorodnitsin was its “inevitable” chairman. When later, in the 1960-s, all scientific groups of computer design were re-subjected and transferred from the Academy to various industrial enterprises (many considered it as doubtful decision) it was A.A. Dorodnitsin, and his academic computing centre, who continued coordination and made efforts to promote technical policy full of commonsense and practical reason. His team made outstanding (organisational) contribution to further progress of the Soviet computing. 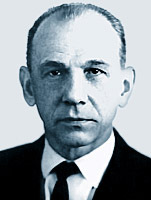 A.A. Dorodnitsin himself was the chairman of the AS USSR Commission on development of the electronic digital computers. As a scholar, Dorodnitsin won respect of the world scientific community on information sciences. He took part in the first ten congresses of the International Federation for Information Processing (IFIP), and was its president in 1983-1986. In 1986, during academic discussion on the subject and main future tasks of computer science A.A. Dorodnitsin argued for intensive “computerising” of “descriptive sciences”, as both the most perspective and urgent one for the current development. He pointed out that the impressive progress of machinery and engineering of the last 2-3 centuries was possible since the basic sciences: physics, mechanics, chemistry were facilitated with all available achievements of mathematics. Therefore each new item could be always calculated (more or less precisely) in advance. A.A. Dorodnitsin summarised his statements approximately as the following: “Just imagine the situation that we have to create everything – a house, a bridge, a locomotive, a radio set – always “blindly experimenting” anew, using methods and technologies at random and not knowing what will be the result”. “However, that is almost the real situation in modern biology, medicine, agriculture”. “I would not like to draw here futuristic pictures on the perspective benefits from turning these domains into predictable, exact sciences, when each result is already calculated before beginning of a research”. “With a bit of fantasy you'll do it yourselves”. “So, that is my position and I am sure that implementation of mathematics and computer technologies in descriptive sciences is one of the most important problems of the nearest future”. Alongside with his scientific work and organisational duties A.A. Dorodnitsin was always teaching at some university. Thus in 1939-1940 he was a lecturer at the mathematical department of the Leningrad Institute of Mining, in 1944- 1946 a professor at the chair of theoretical aerodynamics at the Moscow Institute of Aviation, in 1948-1951 he was a professor at the chair of aerodynamics of the faculty of physics and engineering at the Moscow State University (the USSR leading university). He actively participated in establishing and development of new university – the Moscow Physic and Technical Institute, where he held a chair of aerodynamics (1953-1954), applied mathematics (1967-1971) and mathematical physics (1971-1994). He was also chief-editor of academic journal, “Journal of Computational Mathematics and Mathematical Physics”. A.A. Dorodnitsin was awarded the honourable title “Hero of the Socialist Labour” with “Gold Star” medal as its symbol, what provided the highest social –civil- status in the USSR. He was decorated with five “Lenin Orders” (the USSR highest civil order), with orders: “Sign of Honour”, “October Revolution”, “Red Banner of Labour”, “Friendship of the Soviet Peoples”, “Red Star” (military award) and numerous medals. His scientific contribution was also prized with “Lenin Premium” (the USSR highest premium), three times with the “USSR State Premium”, “Premium of the USSR Council of Ministers” and scientific premiums of academicians A.N. Krylov, N.M. Krylov and V.M. Glushkov. Anatoly Alekseevich Dorodnitsin died in Moscow on the 7 th of June 1994. 1.Nikolay Evgrafovich Kochin (1901-1944) - academician AS USSR from 1939, prominent mathematician and physicist, one of the founders of contemporary dynamic meteorology. (Publication in English: N.E. Kochin, I.A. Kibel, N.V. Roze. „Theoretical hydromechanics“ New York, Interscience Publishers, ( 1965, 1964 )). Sources: “Nikolay Evgrafovich Kochin (to his 100-jubilee)”, in “Applied Mathematics and Mechanics”, (2001. vol.65, issue 2, 179-182), and also “N.E. Kochin Biography“, in „Dictionary of Scientific Biographies” (New York, 1970 - 1990). 2.Ilya Afanasevich Kibel (1904-1970) – academician of the AS USSR, one of the leading Soviet scientists in the field of theoretical hydromechanics. He is also famous as founder of hydro-dynamic method of weather forecast and for implementation of mathematical methods in meteorology. Some of his famous works on the subject are: I.A. Kibel, “Application of Baroclinic Fluid Mechanics Equations to Meteorology,” (in “Izv. Akad. Nauk SSSR”, Ser. Geography-Geophysics., No. 5, 627–638, 1940). I.A. Kibel. “Hydrodynamic Short-Term Forecast in Mesometeorological Problems”, (in „Publications GMTs“, No. 48, 3–33, 1970). I.A. Kibel. “Mode of Short-Term Forecasting of Meteorological Elements,” (in “Selected Works of I.A. Kibel on Dynamic Meteorology”, “Gydrometeoizdat”, Leningrad, 1984 (in Russian)). I.A. Kibel. “Finite-Difference Scheme for Solving the Complete System of Equations of Short-Term Forecasting and Quasi-Geostrophic Relations,” (in “Selected Works of I.A. Kibel on Dynamic Meteorology”. „Gydrometeoizdat“, Leningrad, 1984 (in Russian)). I.A. Kibel. “Hydrodynamic Short-Term Forecast in Meso-meteorological Problems,” (in „Publications GMTs“, No. 48, 3–33, 1970). 3. More on V.A. Steklov Mathematical Institute – very important Soviet mathematical research centre, see in biography of I.Y. Akushskiy. A.A. Dorodnitsin. Selected works. V.1.2. Moscow. Publication of the Computer Centre of the Academy of Sciences Russia 1997. Computation mathematics and computer sciences. Moscow, <ibid>, 1996. Proceedings of scientific session commemorating 85 birthday of A.A. Dorodnitsin. “Academician Anatoly Alekseevich Dorodnitsin. To his jubilee of 80 years.”. Moscow. Publ. by Computer Centre of the AS USSR, 1990. “Anatoly Alekseevich Dorodnitsin”. In “ Bibliography of the USSR scientists”. Series – Mathematics. Issue 13. Moscow. “Nauka”, 1974.